Bradley's Straight Line Picture Cut-outs Mother Goose. Massachusetts: Milton Bradley Company, (1915). ￥29,000 (税込み) (Envelope) 21.5 x 24 cm. 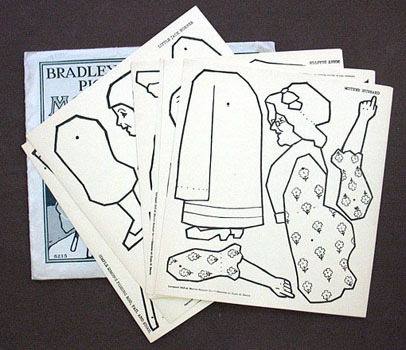 A set of tweleve designed sheets of Mother Goose characters to be cut, colored and combined in original condition, with instruction sheet, folding brochure with descriptions of other sets in the series, in original pictorial envelope (slightly torn).